The sky lights up as fireworks send the most dedicated Scientologists from around the world off to the Freewinds Maiden Voyage Anniversary, June 10-18 in the Caribbean. The convocation is held each year aboard the Church’s religious retreat—Scientology Motor Vessel Freewinds. The Freewinds sets sail on its Maiden Voyage Anniversary Cruise. The annual week-long convocation, attended by Scientologists who have attained the highest spiritual levels in the Church, presents a midyear review of recent successes and charts a future course for expansion. The Scientology Religious Retreat Freewinds casts off from Saint Lucia for her week-long Maiden Voyage celebration. Hundreds of the most dedicated Scientologists wave goodbye to Castries and set out to review the year’s successes, and plan for even more. The fireworks and fanfare continue above and aboard the Freewinds, as she sets off on the first night of an extraordinary week of celebration. Each June the Church celebrates the Freewinds’ Maiden Voyage and this year is no exception, as an array of extraordinary events highlights the ongoing expansion of the religion. 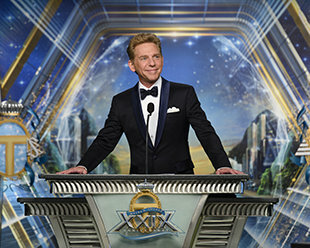 Mr. David Miscavige, ecclesiastical leader of the Scientology religion, is greeted with enthusiasm by an audience of passionate Scientologists, as he takes the stage for the opening night presentation. Mr. David Miscavige officially commences the series of events with an opening night presenting 12 months of monumental Scientology growth. In reviewing the history of the Freewinds and its humanitarian missions, Mr. Miscavige outlined some of the appreciation she and her crew have received from dignitaries and civic leaders around the Caribbean. THE SHIP AND HER CREW receive greetings and gratitude everywhere they go. “The Freewinds doesn’t just come in, spend some time and leave,” said a Caribbean community activist. “They look for areas where the Freewinds can help.” In all, the Freewinds has earned over 400 awards and recognitions. Mr. Miscavige shares vivid stories of the Church’s amazing year of accomplishment around the world, each one raising the bar on success. Daytimes are filled with strategy sessions and plans for continued expansion with representatives on hand from each geographic zone. Each night the passengers gather in the Freewinds’ seemingly star-lit ballroom for captivating presentations. The second evening event is one dedicated to the timeless legacy of Founder L. Ron Hubbard. Mr. Miscavige sparks off a night in honor of L. Ron Hubbard. It is an evening informing and astounding those present with countless previously untold tales of Mr. Hubbard’s legacy, tales that tell of his kindness and his vision. Dan Sherman, Biographer of L. Ron Hubbard, regales the audience throughout an evening with rich stories from the life and legacy of the Scientology Founder. Mr. Sherman presents a biographical presentation of Mr. Hubbard’s kindness at different ports, his vision and his literary skills, and of his expertise not just as a writer, but as a musician and photographer as well. Twenty-two-time Grammy Award Winner, Chick Corea, thrills the crowd with a virtuoso performance of his original jazz classics. Mr. Miscavige launches an evening in honor of the International Association of Scientologists (IAS) and the humanitarian impact they inspire across every corner of society, from major metropolitan centers to remote tribal villages. Mr. Miscavige presents an evening recapping the humanitarian action made possible by the IAS and their social mission across every level of humanity. DELIVERING JUSTICE IN THE LAND OF THE RISING SUN The Citizens Commission on Human Rights (CCHR) Tokyo helped expose and ban 124 abusive psychiatrists who received kickbacks for each patient they admitted. SETTING TRIBAL LAW IN SOUTH AFRICA In South Africa, CCHR inspired a decree against psychiatric drugging across the nation’s largest tribal kingdom. A MULTICULTURAL MESSAGE FOR CANADIAN HUMAN RIGHTS Toronto’s Youth for Human Rights organization held over 180 events in this city where more than 140 languages are spoken, leading to over 2,200 organizations who have adopted the Youth for Human Rights program. GUARANTEEING HUMAN RIGHTS FOR NIGERIA’S NEXT GENERATION Some 20,000 citizens sign pledge boards and 50,000 more receive the Universal Declaration of Human Rights leading to a permanent partnership between Youth for Human Rights and Southern Nigeria’s Universal Education Board. WORKING WITH ALL RELIGIONS FOR HUMAN RIGHTS In Sri Lanka, Youth for Human Rights brought together Hindus, Buddhists, Christians and Muslims to spread the knowledge held in the Universal Declaration of Human Rights to 220,000 people. BRINGING THE TRUTH ABOUT DRUGS TO ANCIENT GROUND Drug-Free World volunteers in Greece blanketed Athenian neighborhoods with 100,000 The Truth About Drugs booklets in a blitz that ultimately effected a 30-percent drug drop. DRUG EDUCATION INTO BAJA’S TRAFFICKING ZONE In Baja, a well-known drug transit route, some 800 educators and 40,000 students received The Truth About Drugs booklets, resulting in first-time drug usage dropping 30 percent. KICKING OFF FOR A DRUG-FREE EURO CUP At the European Football Championships in France, Drug-Free World volunteers handed out a massive 300,000 The Truth About Drugs booklets across 14 cities to create a “safe and secure” tournament. A WAY TO HAPPINESS WAVE ACROSS CUBA When The Way to Happiness was distributed in Cuba, seminars on the 21 precepts generated a morals education movement through 30 towns and villages stretching over 1,200 miles. MONGOLIA’S STUDY TECHNOLOGY REVOLUTION The introduction of Study Technology in Mongolia ultimately saw 24,000 teachers and over 500,000 students embrace the education miracle. NARCONON DRUG REHAB SALVAGES A NATION Nepal’s Narconon Center is a drug rehabilitation phenomenon. Since grand opening in 2013, it has spearheaded a 47-percent reduction in the National Index of Drug Offenses. Over the course of two hours, Mr. Miscavige details a midterm report full with social achievement and focused on renowned IAS-sponsored initiatives. As announcements of accomplishments come to a close, a monumental one is unveiled, thanks in large part to the social betterment campaigns sponsored by the IAS, the Grand Opening of the IAS-sponsored National Church of Scientology in Bogotá and outreach by the Freewinds staff, which has led to millions of copies of The Way to Happiness, The Truth About Drugs and The Story of Human Rights being distributed throughout Colombia. The impact has been miraculous, with a 96-percent drop in human rights violations supporting the peace accord reached between Colombia’s national government and FARC troops, ending 50 years of civil war. So it was, on the 5th of May, 2017, the Church of Scientology was awarded full religious recognition from the nation of Colombia. In all, the evening encompasses a parade of monumental accomplishment in the name of a better world, courtesy of the IAS. The mighty Freewinds returns to her work, setting her humanitarian course in the ports, countries and outer islands of the majestic Caribbean. Saint Lucia—an Eastern Caribbean island nation famous for its pair of dramatically tapered mountains, volcanic beaches, reef-diving sites, fishing villages, and an interior rainforest that leads to cliff-edge waterfalls—was the postcard-perfect scene for the convergence of several hundred of the world’s most dedicated Scientologists. They gathered for a week-long convocation aboard the legendary 440-foot Motor Vessel, Freewinds, a religious retreat for the Church of Scientology, in celebration of the 29th Anniversary of the ship’s Maiden Voyage. Indeed, this was no ordinary cruise, in fact, those on board form a stellar group who have collectively spearheaded the Church’s expansion through the creation of new Churches of Scientology in their respective zones. What’s more, the week-long gathering is helmed by the religion’s ecclesiastical leader, Mr. David Miscavige, so again, this is no ordinary cruise. “Since last we met, our solar system of Churches now includes: Budapest, Hungary; Harlem, New York; San Diego, California; and, the rim of our terrestrial world in Auckland, New Zealand,” he said, before moving on to detail the most recent Church grand openings in the San Fernando Valley, California; Miami, Florida; and Copenhagen, Denmark. But the convocation is not just about looking back, Mr. Miscavige told the assembled. This is the week that sets the agenda for Scientologists around the world to continue the record-breaking expansion that has made the religion a thriving, upward-moving worldwide phenomenon. For the rest of the year, the Freewinds is an extraordinary vessel of benevolent distribution, as she logs and charts adventures that bring humanitarian and educational programs to the Caribbean and Latin America; as well as providing spiritual services for the most advanced Scientologists all year long. But for this week, the guests on the annual cruise will not only celebrate their own good works on behalf of the Church, but will target, plan and put into action future expansion while participating in extraordinary evening events, each with a unique and striking focus. But her safety is not her only hallmark, and not her particular calling card. It is in fact her ongoing mission for humanity as she plies the azure Caribbean waters. From human rights campaigns reaching island inhabitants across the windward isle of Saint Vincent; to drug education proliferation over Bonaire’s TV and radio airwaves to counteract endemic drug abuse; and morals education by way of The Way to Happiness, which earned exuberant praise from Aruba’s Ministry of Justice. In fact, the value of the Freewinds’ mission was repeatedly acknowledged in testaments from grateful island officials who have personally witnessed the benefits. The next night, guests were treated to a biographical presentation in honor of L. Ron Hubbard (LRH). It was an evening informing and astounding those in attendance with countless previously untold tales of Mr. Hubbard’s legacy. Tales presented by the LRH Biographer, Dan Sherman, that spoke to both Mr. Hubbard’s kindness and his vision. At the heart of the evening were on-camera interviews featuring vivid personal accounts of those who had encountered L. Ron Hubbard and were forever changed. The Citizens Commission on Human Rights who exposed and curbed psychiatric abuse in Tokyo hospitals, across South Africa’s largest tribal kingdom and on the streets of South Florida. United for Human Rights and Youth for Human Rights, who sparked a human rights movement in Toronto—the most ethnically diverse city on Earth, in Africa’s most populous land of Nigeria and in Sri Lanka, where Hindus, Buddhists, Christians and Muslims worked together to spread the Universal Declaration of Human Rights. Drug-Free World, who carried out their crusades with The Truth About Drugs across Athenian neighborhoods, through Baja’s notorious drug transit route and up and down the playing fields of the European Football Championships. And finally, through the social betterment work of IAS-supported programs where the Way to Happiness generated a moral resurgence through Cuban towns and villages, Study Technology ignited an education revolution in Mongolia and Narconon drug rehabilitation struck at the core of Nepal’s addiction culture. As announcements of accomplishments came to a close, a monumental one was unveiled. And it rode directly upon the wake of the Freewinds in tandem with IAS support, because working with volunteers, law enforcement and Scientologists, literally millions of copies of The Way to Happiness, The Truth About Drugs and The Story of Human Rights were distributed in major cities and jungle villages throughout Colombia. As a result, what was once the acknowledged drug capital of the world, and a country the United Nations classified as the “worst humanitarian crisis in the Western Hemisphere,” soon became the “Colombian Miracle” with military human rights violations dropping an incredible 96 percent. Directly on the heels of that was the grand opening of Colombia’s IAS-sponsored National Church of Scientology where they continued to work tirelessly to provide the solutions for restoring humanity. Soon to follow was the astounding peace accord between Colombia’s national government and FARC troops, after which 8,500 police were personally trained by Freewinds staff in vital life skills for use in reintegrating FARC troops back into society. But, even so, that’s not the end of the story. Because, less than a decade after the Freewinds first docked in Cartagena, Mr. Miscavige pronounced the next epic accomplishment: that on the 5th of May, 2017, the nation of Colombia awarded the Church of Scientology full religious recognition. It was yet another example that the combination of the Freewinds, Scientologists, global changemakers and the inspiration of L. Ron Hubbard’s technology for living, continue to lead to the betterment of humanity. So, as the passengers prepared to leave the ship, they and thousands more are bound and determined to resume their year-long work of uplifting society and improving humanitarian conditions worldwide, one nation, indeed one port at a time, for the next 51 weeks.